This alcoholism questionnaire survey form is intended to check out the status of alcohol consumption of a particular individual. According to the department of health guidelines for safe drinking, drinking over three unite per day, on a regular basis indicates to an enhanced risk factor to your health. 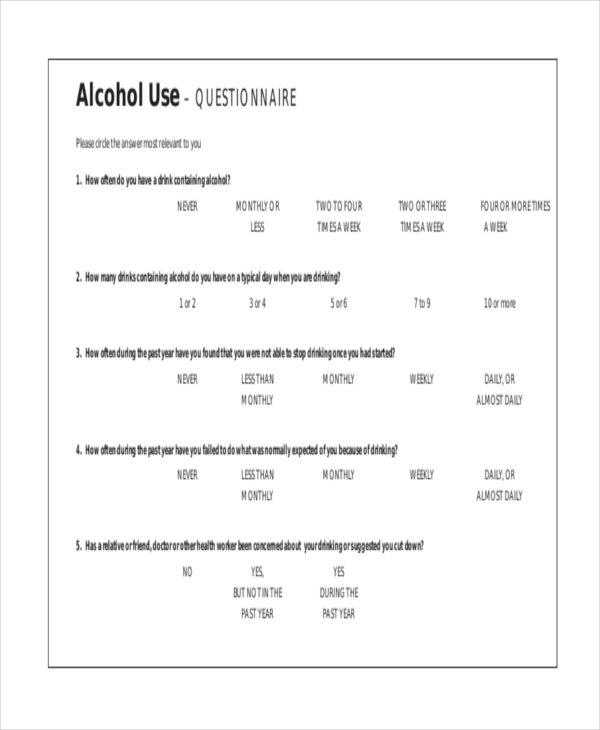 Therefore, the alcoholism questionnaire survey form will help to balance your alcohol intake. 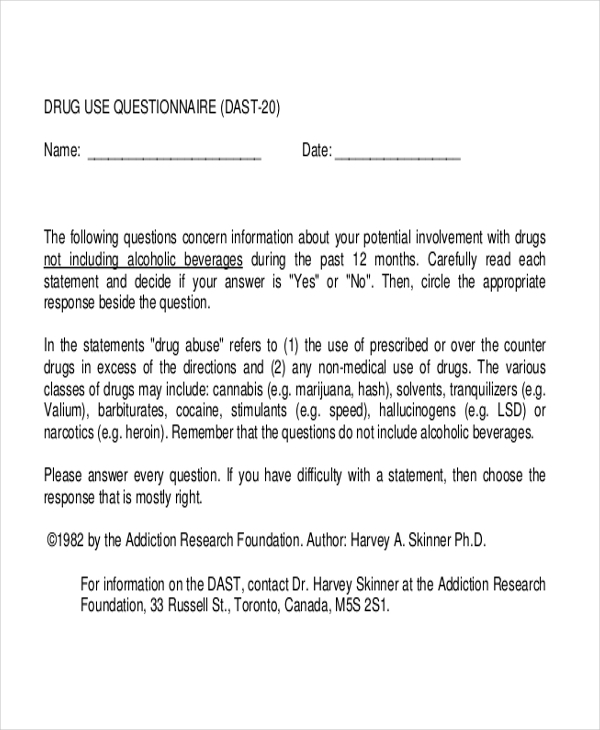 This alcohol use questionnaire form includes several questions such as how often an individual has a drink containing alcohol substances? How many drinks containing these substances does he/she have on a normal day? Such kinds of questions have been asked via the alcoholism questionnaire form. This particular airline questionnaire form is initiated by the International Trade Administration. 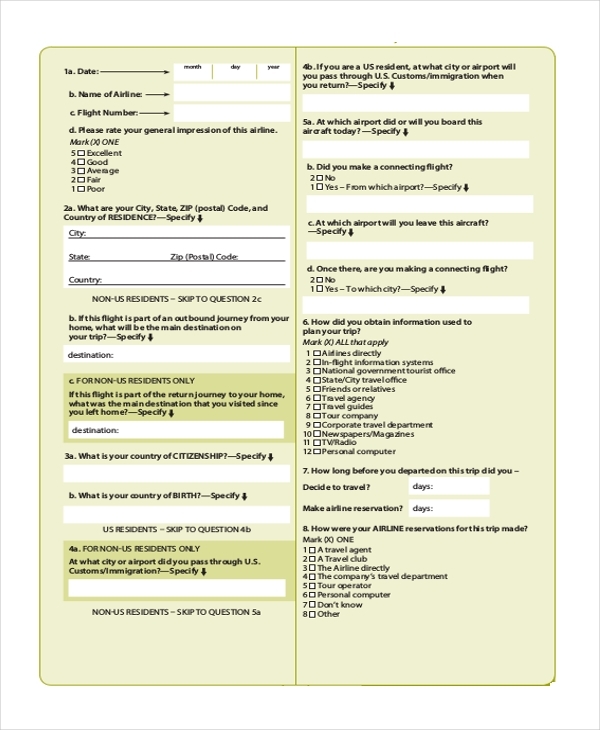 This form is created with the purpose of making a survey of the international air travels of the United States. The airline authority requires the international travelers to help improve the services offered by the particular airlines agency. The travelers need to fill out and submit the questionnaire survey forms in order to share their true opinions about the services of the particular agency. This information will be used by the government travel; officers, the travel agents, hotel authorities, airlines and other travel planners. By scrutinizing the information, the airlines authority will be able to understand how their services help the international travelers. They will also take initiative steps to improve their services so that your next international trip would be hazard free and comfortable. This specific surveye from is supposed to be completed by both the U.S residents who are traveling abroad and the non U.S residents who have visited the country. The applicant, who is filling out the form, needs to be minimum 18 years old. The applicant needs to return this form to the person who gave it to him/her. 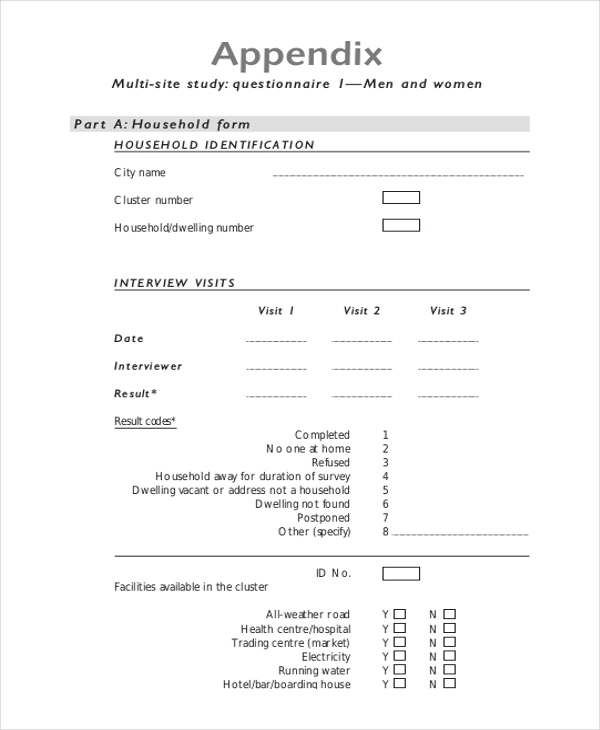 The aids questionnaire form is created for the purpose of tracing sexual networks. This particular survey form is initiated by the unpaid best practice collection. This specific questionnaire was developed with the assistance of E. Konings, J. Cleland and J.Anafri. This initiative is considered to be a part of the attempt to get insights about the countries where researchers and managers of AIDS programs are basically interested in getting additional data on sexual mixing patterns for intervention purposes. Making a business ethics questionnaire survey requires a lot of research and writing. These two qualities generally take the opinion and insight of a senior executive. This survey form is intended to examine the ways of managing and handling a business. This form also helps to making effective strategies for a business. the bank questionnaire survey form is designed to get the overall idea of a bank’s every transactions and the current financial condition. 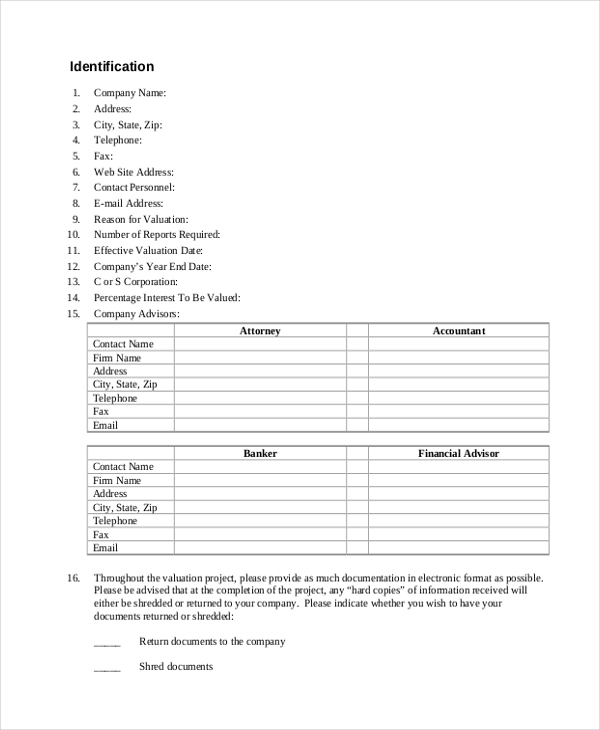 Apart from the basic things such as the name of the bank, the name of the respondent, this questionnaire survey form deals with several queries such as how have the credit standards of the particular bank changed? What are the costs of funds and balance sheet constrains? How much pressure does the bank get from other competitors? What are the perceptions of risks? Are there any other factors? the cell phone questionnaire survey is a nationwide survey which is initiated by mainly the nonprofit organizations. The purpose of this survey is to learn more about the topics faced by the American families these days. The opinion of every cell phone users is very important for the authorities who are conducting these surveys. The major benefit of this survey is that it takes a little time to be completed. The Cell phone questionnaire survey form includes questions such as how many the user sends or receives SMS using the cell phone? If the user’s child is also using a cell phone, how old is she/he? 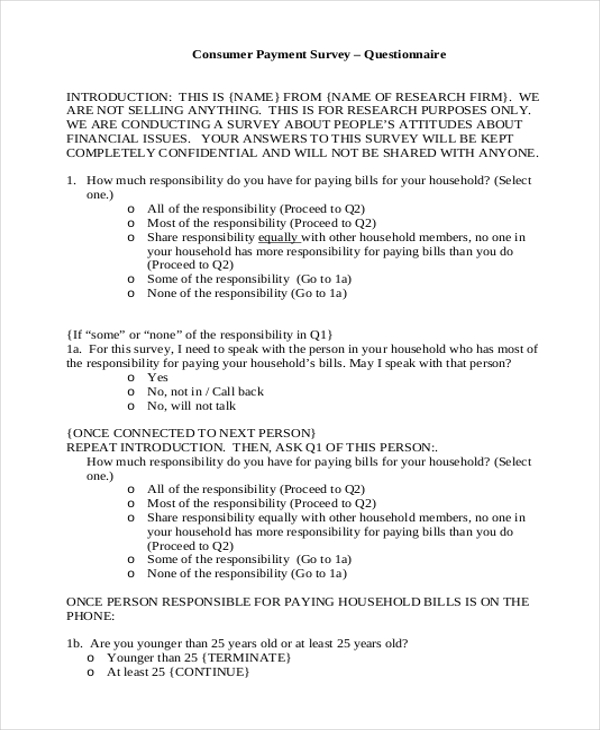 The cell phone questionnaire form basically deals with the regular use of cell phones. By asking some simple and basic questions, the authority actually seeks to get an average user experience of the cell phones. 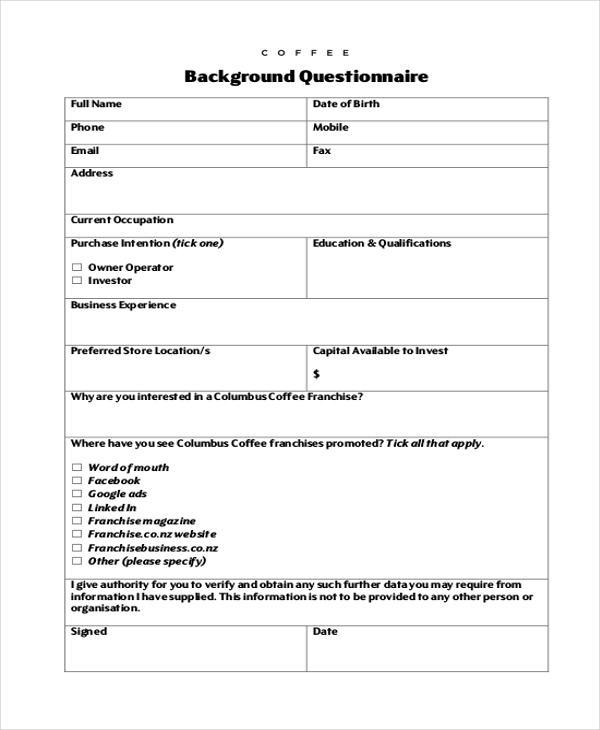 this particular coffee questionnaire form is initiated by East Timor. The survey was intended to involve the economists as much as possible. The survey was generated to cover two important areas of research such ads the field study and the literature review. The survey form typically7 has two main segments of focus. The first one is designed to get the information regarding the information about the coffee farmers by means of household structure, sales by the level of processing, levee of the production of coffee(based on the kinds of coffee), the amount of time spent on the production of the coffee and so on. 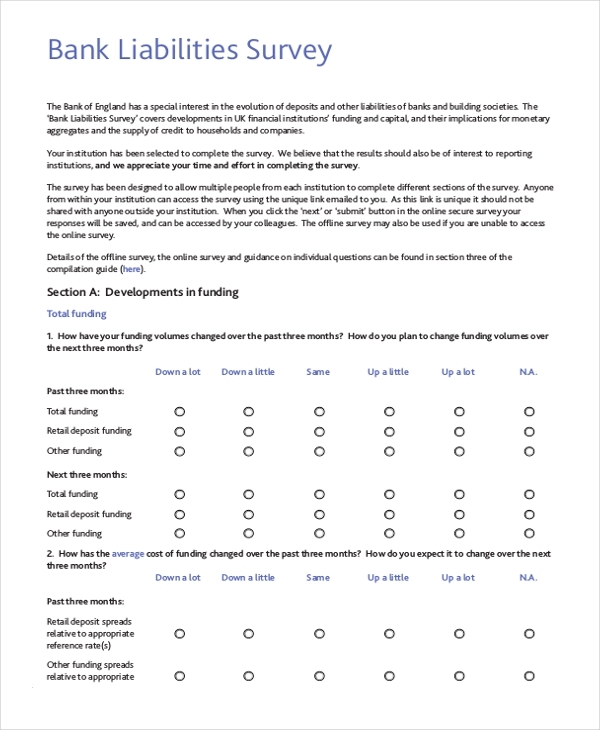 The survey form also deals with several questions related to the land owner, the year end levels of stocks, the actual and desired amount of revenue and the entire storage capacity of the house. the specific survey is organised by the ‘eat well be active’ community program which is sponsored by the SA health. The particular survey is delivered by the Muree Malley community health service and the Southern Adelaide Health Service. The questionnaire will actually help the organizers to get an overall idea of what is actually happening in the school canteens. The survey will give them a better idea on the effective steps which are required to take for the betterment of the canteen systems and all. The applicant has the full freedom to choose among the set of the questions. The applicant is free to not answer to any particular question and he/ she can end filling out the form at any time. But if the applicant decides to fill out the form, he/she has to submit it to the concerned person within the given schedule. first of all, it is essential to inform that the credit card questionnaire survey is meant to be only for the purpose of research. The form is not designed to fulfill any kind of sales purpose. The applicant of the particular questionnaire has to provide data related to his/her overall usage of the credit cards. The applicant needs to give answers to certain questions related to his/her amount of responsibility for paying all the bills of his/her entire household. Apart from that, the applicant also has to provide his/her basic information such as name, age, address, source of income and so on. the diabetes questionnaire survey is done to have an overall idea about the diabetes patients. The purpose of the survey is to help the health care providers to handle their diabetes patients in a better way. 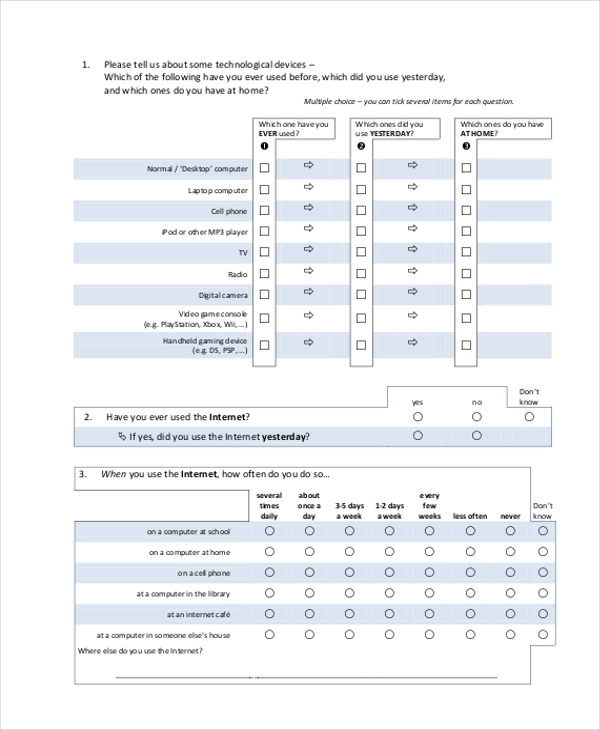 The applicant, who is filling out the form, needs to answer certain questions via this form which conveys the current diabetes problems which are disturbing the applicant. The applicant has to write about whether he/she is feeling discouraged to the entire diabetes treatment plans or not. The questionnaire forms help a lot to understand the quality of the health care programs and services. The days of searching some important document in the market have gone. Now everything is accessible from the internet. These survey forms are also no exception. You can easily download these forms from our websites; we will also edit the forms if you are not satisfied with the current versions of these forms.